Борьба монарха и парламента привела к революции, из­вестной под названием: Славная революция 1688 года. Король Яков II был свергнут и вынужден покинуть страну. Его подо­зревали в желании сделать католическую религию официаль­ной религией в Англии. В соответствии с Актом о престоло­наследии (Act of Settlement), опубликованным после Славной революции, принц Вильгельм Оранский и его супруга Мария взошли на трон. Условием их коронации было принятие ими английского Билля о правах. 1. What events preceded the Bill of Rights? 2. Why did King James have to leave the country? 3. What document regulates succession since 1688? 4. How were the rights of the monarch limited by the Bill of Rights? 5. What civil rights were protected by this document? 6. What was the influence of the Bill of Rights on political thinking in America? The laws of much of continental Europe (particularly France), of Quebec in Canada, and of much of Latin America — along with the civil laws of Louisiana — owe their modern form largely to the work of a man who never even studied law. Napoleon Bonaparte, the Corsican soldier who became emperor of France after the French Revolution, established in 1800 five commissions to refine and organise the diverse legal systems of France. The result, enacted in 1804, was the Napoleon's Code. Some of its original 2,281 articles were drafted by Napoleon himself, and all were affected by his thinking, even though he was completely self-taught in legal matters- The code was a triumphant attempt to create a legal system that treated all citizens as equals without regard to their rank or previous privileges. It was also so clearly written that it could be read and understood by ordinary people at a time when only Latin scholars could make sense of the earlier laws handed down since Roman times. The code was adopted intact in most of the areas of Europe that Napoleon dominated and spread from there across the Atlantic! taking root particularly in French-speaking American communities. Many of its principles are still in force today. Retell the text using the active vocabulary. 1. What efforts did Napoleon make to reorganise the diverse legal systems of France? 2. Did Napoleon draw up the whole code himself? 3. What was so remarkable about Napoleon's new code? ordinary people? 5. Which countries throughout the world still use the elements of Napoleon's code? четырех крупнейших юристов под руководством Наполеона в течение короткого времени усовершенствовала и привела в соответствие все действующие законы, постановления и мест­ные обычаи Франции. В 1804 г. этот грандиозный свод законов, состоящий из 2281 статьи, был утвержден под названием Гражданского кодекса. Главное в этом кодексе то, что он ут­верждал равенство всех перед законом, свободу совести, не­прикосновенность лнчиости и собственности. Сам Наполеон хорошо понимал историческое значение своей законотворческой деятельности ''Моя истинная слава, — говорил он, — не в том, что я выиграл сорок сражений. Но то, что не может быть забыто, то, что будет жить вечно — это мой Гражданский кодекс". 9 History is the version of past events that people have decided to agree upon. • It is the success which makes great men. • From sublime to ridiculousness there is only one step. • Public morals are natural complement of all laws:, they are by themselves an entire code. 1. 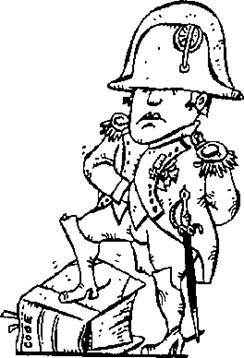 The main points of Napoleon's biography. 2. The great victories of Napoleon Bonaparte. 3. One hundred days of Napoleon Bonaparte. What legal codes have you studied in your classes of law? Make a report on a subject of your choice and present it in class. Use the patterns and vocabulary jrum the Chapter.